Congratulations on your engagement and upcoming wedding. I know that your wedding day is the most special time of your lives, and you want your entertainment to be as perfect as possible. My unique voice, entertainment style and many years of professional experience allows me to do just that! I always add an entertainment "wow factor" to your special day that will be remembered for a very long time. 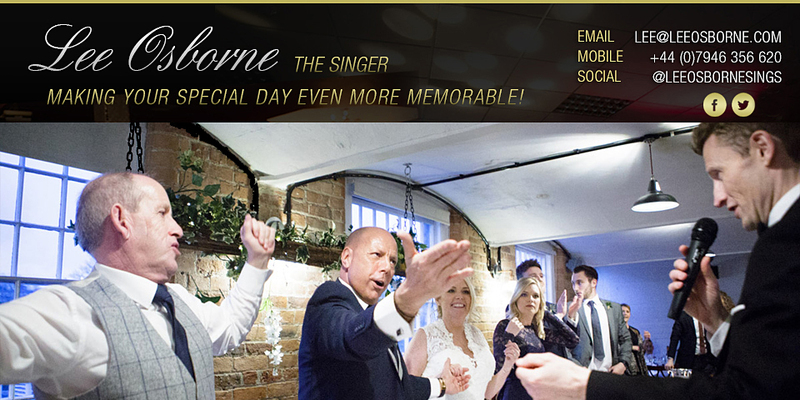 I can provide live singing entertainement at one part of your big day, or, a complete Singing/Toastmaster/MC/DJ package, depending on the date and location of your wedding. Pricing starts from just £300 depending on date and location. I am one of the most popular event entertainment providers at the present time. Since 2008 I have performed at over four hundred events and received hundreds of up-to-date genuine reviews. 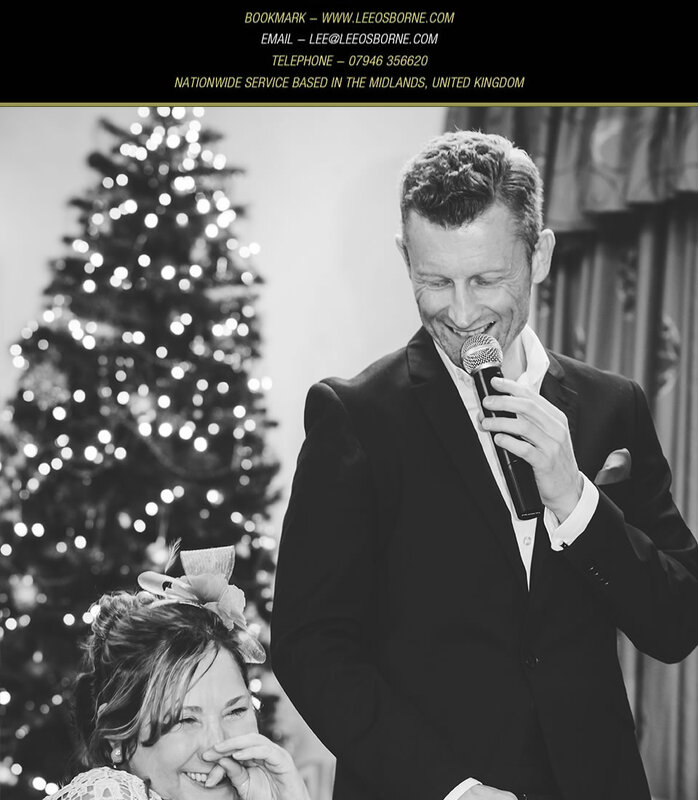 I have performed at some of the finest wedding venues from the small and intimate to large and grand and I am trusted to regulary provide entertainment for several high profile clients including Warner Hotels, The Shard, Zurich Insurance, Wilmington Plc, Hilton Hotels and many more. I can make the entertainment planning completely stress free and straightforward. I happily dedicate the time and planning your wedding deserves, either with you, or by liasing with the venue coordinator. My availability changes on a daily basis due to word of mouth, my professional booking agent, online advertising and regular wedding fayre exhibiting. So please get in touch at your earliest opportunity. "I booked lee for my sister's wedding last Saturday 16/2/19 he was truly amazing, family and friends commented on how good he was. We also booked Lee for our own wedding back on Saturday 3rd August 2013 at Drayton Manor! I would recommend to anyone who's thinking of booking a singer for their wedding, thank you lee for another great performance, I'm sure I will book you again in the future." There is nothing better than adding some amazing memories to weddings and other special occasions - I simply love making people smile and hearing the compliments I receive. I sing at all types of functions, events and occasions including (but not limited to) venue entertainment, weddings, birthdays, wakes, anniversaries, corporate functions, etc. First and foremost weddings are my passion, and when not singing at a wedding, I am also highly regarded enough to perform professionally at cabaret venues throughout the UK and as part of live Swing bands. I am a true pro carrying Public Liability Insurance cover as required by many UK venues. My equipment is PAT safety tested annually. All of my testimonials and reviews are genuine and can be provided on request. My work area is typically anywhere in the UK including London, Staffordshire, Shropshire, Derbyshire, Leicestershire, Nottinghamshire, Merseyside, Greater Manchester, Chester, Yorkshire, Warwickshire, Bedfordshire, Oxfordshire, Buckinghamshire and Gloucestershire. Don't hesitate to ask wherever your event is taking place! I have been an entertainer since 2000 and I became a full time professional in 2008 and my business continues to grow rapidly. I am always striving to fine tune all aspects of my service, value for money and provide the best results possible. Of course, I can perform with a live band depending on availability or a band of your choosing! I have experience performing with some of the UK's finest musicians. ©2018 Lee Osborne. Website design and content are subject to copyright and may not be copied or reproduced without written permission. Company Number 11183555.